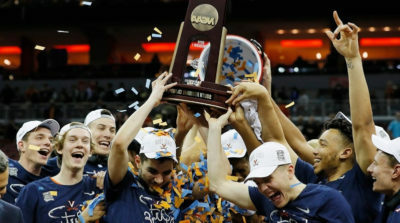 After becoming the first #1 seed to lose in the first round last year, Virginia got crowned after two thrilling matchups against Auburn and Texas Tech. In the first semi, despite MSU having the size advantage, Texas Tech destroyed the Spartans, limiting them to 32% FG. Inside, Tillman and Goins scored just one basket inside the 3pt line in 68min combined with Tariq Owens acting as the scarecrow (3bl). The Red Raiders above all prevented Winston from creating as he scored 16pts but on 4/16 while dishing only 2as for 4tos. On offense, Mooney was the man with 22pts on 4/8 from three. Texas tech’s stiffling defense was too hard to handle for Izzo and his boys as the Red Raiders gained their first shot at a title of their history. Despite the injury of first round prospect Chuma Okeke, Auburn had no intention to let Virginia impose its will. Down ten 5min from the end of the game, Auburn found the strength to come back thanks to Bryce Brown and his 3 three pointers which allow the Tigers to take the lead. The rest is history. Down four 15s from the end, Guy hits an incredible three pointer. After being fouled, Harper hit only one from two from the FT line and gives Virginia an opportunity to tie or win the game. With the Tigers still having fouls to give, Jerome is fouled twice, the second time after he clearly double dribbled. Guy once again somehow gets open for a three and is clearly fouled by Doughty. The junior from Indiana remains ice cold and hits all his free throws to send Virginia to its first championship game. Hunter, Guy and Jerome combined for 50pts on 20/38 while Diakite had 5bl for the Cavaliers. In a matchup between two of the best defensive teams in the country, the Cavaliers finished the first half with a 2pt lead as Hunter only made one FG. Yet, the Philadelphia native decided to display why he was a potential top 5 pick as he scored 10pts in the first 10min of the second half, helping Virginia take a 10pt lead. The Texas Tech grinders, Moretti, Francis, Mooney, Edwards, Odiase and their star Culver kept fighting as they came back and even hoped to shock the world as Culver’s lay up and Odiase’s free throws put the Raiders 3pt ahead with 22s to go. As Jerome was driving for the lay up, the Red Raiders could have let him score to keep the lead. Culver decided otherwise by helping on defense, letting Hunter open for the tying three. After 2min in overtime, Guy and Hunter ignited a 11-0 run that would ruin Texas Tech’s dream. Hunter and Guy, the Final Four MOP, combined for 51pts on 8/14 from three. Jerome was his usual self with 16pts 8as 1to while Key (6pts 10rbds) and Diakite (9pts 7rbds 2bl) were perfect complements to the trio of stars. The Cavaliers should have lost against Gardner-Webb, Purdue, Auburn and Texas Tech. They always found the heart and solutions, thanks to Coach Bennett, to hit the clutch shots and have made people forget last year’s unfortunate experience. With Hunter and probably Jerome set to leave, it will be hard for Guy, Clark or Diakite to be as good next year. Let them enjoy the moment and as Rudy T used to say, never underestimate the heart of a champion. Previous Previous post: Final Four preview : Will MSU prevent TT, UVA or Auburn from winning their first title ?